WMF scissors can turn the perfect cut from a dream into reality. Our scissors are precision cutting implements that have both effective functionality and an ergonomic design. Household scissors are among the most important everyday items in any kitchen. Yet although they appear to be a simple tool, the choice is wide. Many people have had a bad experience with low-quality scissors that left them with a sore thumb and a bitter after-taste. Careful manufacture, highest quality and a well thought-out design ensure that you'll be happy with your WMF scissors for a long time. Of course, the most important quality criterion of a pair of scissors is their ability to cut. Multi-purpose scissors must cut with great precision and yet be able to be used with a minimum of effort.  The developers at WMF therefore work constantly to ensure our blades are ground even more precisely and open and close in perfect harmony. The blades are curved and bend towards one another so that they meet at only two points. Exact determination of the angle of the facet ensures that WMF scissors have the perfect combination of sharpness and durability. Household scissors are an essential tool for every aspect of our lives. They open food packaging, remove labels from new clothes and can be used for arts and crafts projects with your children. It's therefore important that they are comfortable to use. All our household scissors have an ergonomic design. The eye rings are made to fit the natural shape of your hand and fingers and have the largest possible hand rest for greater comfort. Because WMF knows that different types of scissors are needed for different purposes, you'll find a wide range of models to choose from at our online shop. Do you prefer round, oval, longer or even bean-shaped handles? We have the right shape for every taste. WMF even lets you choose the quality of the materials. In addition to models made from top-quality special blade steel, we also have household scissors with a high-quality plastic handle. We even have different colours to choose from. So browse around the WMF online shop until you find your perfect household scissors – and you'll never be without your ideal kitchen helper again.